The latest round of negotiations on Brexit ended this week in Brussels with mixed reviews. Citizens’ Rights is one of the three key areas on which the EU insists sufficient progress must be made in the withdrawal negotiations before it will begin to talk about any future relationship between the EU and the UK. So far, it seems unlikely that the EU will accept that enough progress has been made in this area at the European Council in October and the latest technical note highlights some key areas of disagreement. The British Government is meant to be representing the interests of British citizens in the Brexit process, but recent statements raise serious questions about their ability to understand and represent the position of British people concerned about losing their EU citizenship and all that entails. Last Friday Theresa May said, in her Florence speech that “… throughout its membership, the United Kingdom has never totally felt at home being in the European Union.” And Boris Johnson, in his Telegraph article the previous week said: “I look at so many young people with the 12 stars lipsticked on their faces and I am troubled with the thought that people are beginning to have genuinely split allegiances.” For many, these statements do not reflect the way they feel about being both British and European – so where can we find policy makers that can and will stand up for our rights? -Further free movement rights - the EU position is that “UK nationals in scope of withdrawal agreement only have protected rights in the state(s) in which they have residence rights on exit day, without prejudice to Social Security rights. Conditions for return as provided under EU law….” The UK position is that all UK nationals in the scope of the agreement should retain existing rights to move between EU 27 countries. -Voting rights – the EU position is that “Member states are free to give voting rights to third country nationals regardless of the withdrawal agreement.” This will mean different practices in different countries. The UK position is to protect existing rights in the withdrawal agreement. These two issues are the essence of EU citizenship for British people who cherish and rely on both their British and European identities. This should not be an issue of “us against them” in the negotiations. As Guy Verhofstadt made clear, MEPs have a duty to defend citizens’ rights, whatever their nationality, and for the time being MEPs represent British citizens both in the UK and those currently residing in the EU 27. He says that “we are fighting for EU citizenship as a translation of what it means to belong in Europe…. European Citizenship is not a by-product of nationality, because you are by accident born in an EU Member State…” The European Parliament needs to make sure that this principle is not forgotten by other EU institutions in the negotiations on Brexit. At the moment, whether or not a British citizen will be able to retain EU citizenship following Brexit depends on a number of accidents – whether you, a parent, grandparent or spouse happened to be born in another EU Member State; whether you happen to be currently residing in an EU Member State; and how the EU Member State you happen to be connected with manages its rules on naturalisation and dual nationality. None of these factors has anything to do with how “European” a person may feel and none of them fit with the concept of European Citizenship and multiple layers of identity that Guy Verhofstadt is talking about. Some MEPs, including Guy Verhofstadt, have shown that they understand the importance of EU citizenship to many British citizens and have made proposals around associate citizenship in an attempt to grapple with the issues but so far this has not been recognised in the EU negotiating position. Although not directly involved in the negotiations, the European Parliament will ultimately have to consent to the Withdrawal Agreement negotiated by the EU and the UK. But the issues involved are too complex to leave to the blunt instrument of a potential veto from the European Parliament. The EU and its Member States need to recognise that the issue of UK citizens’ futures in the EU post-Brexit is not just a question of a quid pro quo with the UK Government – rather, the way the EU treats its British citizens and their rights in the Brexit process is a test of its commitment to European values and the essence of EU citizenship. With the clock ticking on the Article 50 timetable, it is crucial that issues of EU citizenship and associated rights beyond the simple right to reside take centre stage if the EU is to live up to its values and send a signal about what Europe means for the future. 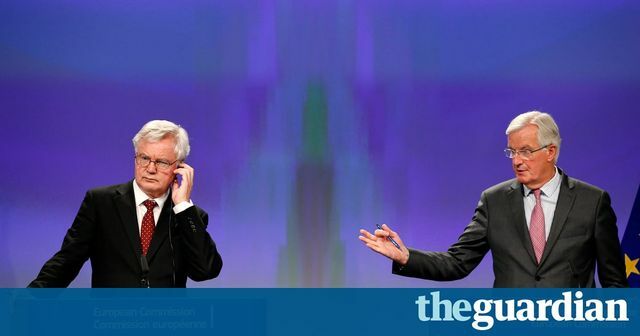 A “new dynamic” had been created by Theresa May’s speech in Florence last week, Michel Barnier said during a press conference with the Brexit secretary, David Davis. Both parties agreed that progress had been made, especially on the issue of citizens’ rights, but it became clear from comments in Brussels and elsewhere that outstanding issues remained.